When Bill Clinton left the White House and set up office in Harlem, New York, my artist friends hastily removed themselves further up the A-line to Washington Heights, a largely Latino, mostly Dominican neighbourhood, with a declining white population, safely beyond the conservative forces of upward mobility. Gentrification can be a mixed blessing. Property values go up, and with them rentals. The poor, the elderly, the small retailers, and the historical buildings they occupy, all of which gives a suburb its distinctive character, find themselves on the wrong end of a developer’s wrecking ball. Few of us want to live in a crime-ridden slum no matter how characterful its architecture, but restoration and social upliftment is preferable to demolition and forced removals for profit. My school geography teacher said it was only a matter of time before Woodstock would boom. That was 25 years ago. In the interim, there have been several waves of 30-somethings speculating with their professional incomes, believing they rode the crest of gentrification and would be afloat with the rewards of the imminent property boom. Many found themselves washed back out to rentals in the city bowl; Woodstock, even with its proximity to the city and ripe with commercial corridors, stubbornly refusing to be the next Green Point. In the decade straddling 1900, the population of Cape Town exploded with new immigrants and brought into being the suburb of Woodstock, formerly the seaside bathing spot of Papendorp which had quadrupled in population in a little over ten years. A ‘grey’ area, never quite conquered by the apartheid Group Areas Act, it established its identity pretty early on; while in 1908, dry Observatory had 16 churches, Woodstock had 20 bottle stores. Slow and uneven, but overall steady progress, from the Palm Centre to the Biscuit Mill, seems now to be gaining momentum. The innumerable paint stores on the main road have finally found application for their products within their own precinct. There is even the Upper Woodstock Aesthetics Advisory Committee. So it’s out with squatters and statutory tenants, and in with designer furniture, creative industries and art galleries. All this, and right now one is still hopeful, can only benefit the residents in their dilapidated buildings one block behind the new facades. A geriatric clinic and no less than five new neighbourhood old age homes are encouraging signs. And where there are advertising agencies and office workers, restaurants soon follow. A good example of what can happen is the Bromwell Hotel dating from 1927. With 56 known tenants and only one working toilet, it festered on the market for three years. Finally condemned by the fire and health departments, instead of being knocked down, it was sold and renovated. It’s now a boutique mall, boulangerie, deli and mildly pretentious café called Bread with off-street parking and a doorman outside in top hat and tails. The Italian coffee served in designer cups that favour the right handed is organic. The menu is simple and pricey, with three choices of each: petite sandwiches (R45), wholesome salads (R55), mains (R70 – R80) – ravioli, chicken breast, burger, and desserts. Further up the drag is Superette, a café outlet for the organizers of the Neighbourgoods Market, offering locally sourced seasonal fare. It has a roomy, elegantly neutral interior, with soft greys and whites, with bowls of lemons and flowerpots as yellow accents, and pretty sprigs of fresh fynbos. There are bottles of agave nectar sugar and jars of organic vanilla pod. A long window table with magazines and bar stools allow privacy and comfort for solitary customers. A daily menu, written up in Koki pen on the open kitchen’s tiles, offers good value. The all day breakfast sandwich (R35) of bacon, cherry tomatoes and scrambled egg is served on large plates on which are glazed somewhat oddly chosen quotations from Shimon Peres to Bill Bryson. For lunch, there is pork belly or lasagne or sandwiches (Chalmar steak, tuna, giant bratwurst). The eatery that pioneered this gastronomic phalanx into Woodstock is simply named The Kitchen. 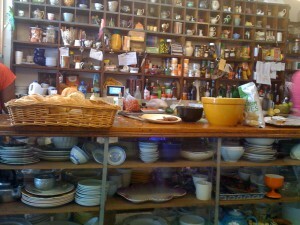 It has that bric-a-brac feel of Woodstock main road, with a grid wall of wooden shelves and a glass display counter filled with old plates, bowls, cups, vases and tshatshkes. I highly recommend the R40 salad plate with lentils, wild rice and mustard; beetroot, radish and coriander; mielies and yellow peppers; green leaves; to which may be added R5 extras such as feta, avocado, grilled aubergine and roast chicken. The most recent to open is La Bottega, from the owners of one of my favourite little spots, Nonna Lina, in the city. Their enormous wooden deck (about 100m2) will work well on sunny days. Inside, the emphasis seems to be on the bar and a big screen television for sport broadcasts. Their special feature is build your own Italian piada (a thin flatbread) to which you add charcuteries and cheese; the kitchen then warms it up for you. It’s still teething time; the lunches – panini, pasta, salad and pizza – don’t yet measure up to their standard in town. I had gooey penne in a sauce somehow at once stodgy and separating. But one thing seems sure; unlike the beurre blanc, the renaissance of Woodstock seems irreversible. Bread, The Bromwell, 250 Albert Road, Woodstock. Tel: 021 447 4730. The Kitchen, 111 Sir Lowry Road, Woodstock. Tel: 021 462 2201. La Bottega, Buchanan Square, 160 Sir Lowry Road, Woostock. Tel: 021 461 9731. Superette, 218 Albert Road, Woodstock, Cape Town. Tel: 021 802 5525. All are open for breakfast and lunch.